Keg stands, ''dizzy izzy's'' and your pong pals - shot gun! - what else do you need? 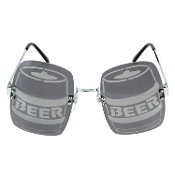 These rimless kegger glasses, that's what. With their high quality metal hinges, rimless design and mirror printing, you'll be the one everyone high five's in the keg line! Rave Party Pong Drinking Game - KEG KEGGER SUN GLASSES - Funky Novelty Graduation Gag Gift Silly Joke Prank Halloween Costume Bar Cocktail Waitress Bartender Accessory!